Click within the Spotlight search box on the Finder menu bar and type Network Utility. Click the Network Utility application entry in the Spotlight search results. Click the Ping tab; see the upcoming figure. 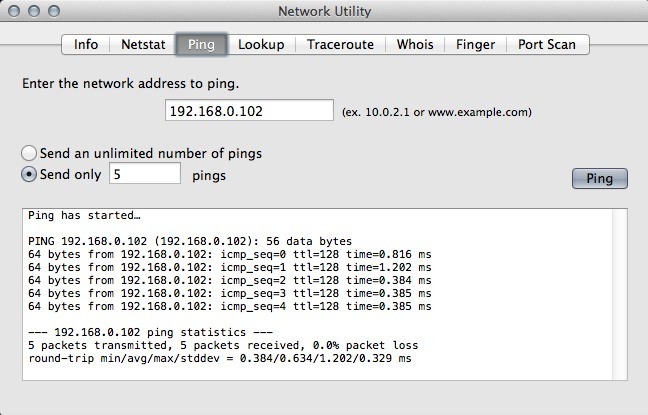 If you’re pinging another Mac running OS X, you can get the IP address of that machine by simply displaying its Network pane within System Preferences, which always displays the IP address. 1. Click Start, right-click Network (Vista and Windows 7), and then choose Properties. 2. From the Network Connections window, right-click your Local Area Network connection icon and then choose Status. 3. Click the Support tab. The IP address of that PC is proudly displayed. Select the Send Only x Pings radio button and enter 2 in the text field. Yay! : If everything is working, you should see results similar to those shown in the figure, in which a Windows server is being pinged at the IP address 192.168.0.102, across a wired Ethernet network. The results of a ping.